DO NOT BE AFRAID; JUST HAVE FAITH. Our readings for this Sunday ask us to consider God's plan for creation. While sin and death entered the world, Jesus is the means by which we overcome sin and death. Our first reading for this Sunday (Wisdom 1:13-15, 2:23-24) tells us "God did not make death." Here, the author means the full nature of death - physical and spiritual, complete separation from God for all eternity. This separation was brought to the world through the "envy of the devil." God's intention is that death is simply a falling asleep, as we will see in today's Gospel. And when we awake? Eternal life with our Father Creator awaits us. In our Gospel reading (Mark 5:21-43), we hear two example's of Jesus' healing love, one nested within the other. In both events, the supplicant falls at the feet of Jesus, begging for his healing touch. First, Jairus, a wealthy synagogue official, pleads for Jesus to heal his daughter who is near death. 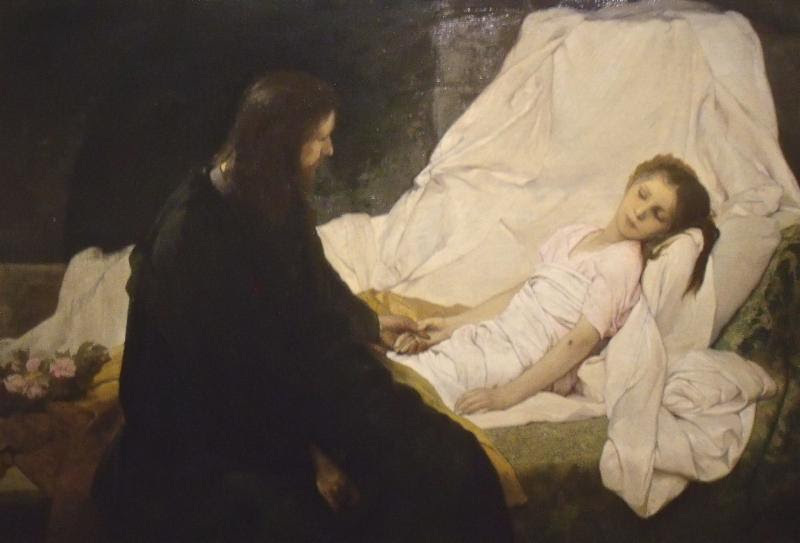 While on the way, she dies but Jesus tells Jairus, "Do not be afraid; just have faith" and insists, "the child is not dead but asleep." In the second event, a hemorrhagic woman, a social outcast, merely touches the cloak of Jesus, in complete faith that she would be healed. "He said to her, "Daughter, your faith has saved you." There was a woman afflicted with hemorrhages for twelve years. She had suffered greatly at the hands of many doctors and had spent all that she had. Yet she was not helped but only grew worse. She had heard about Jesus and came up behind him in the crowd and touched his cloak. She said, "If I but touch his clothes, I shall be cured." Immediately her flow of blood dried up. She felt in her body that she was healed of her affliction. Jesus, aware at once that power had gone out from him, turned around in the crowd and asked, "Who has touched my clothes?" But his disciples said to Jesus, "You see how the crowd is pressing upon you, and yet you ask, 'Who touched me?'" And he looked around to see who had done it. The woman, realizing what had happened to her, approached in fear and trembling. She fell down before Jesus and told him the whole truth. He said to her, "Daughter, your faith has saved you. Go in peace and be cured of your affliction." While he was still speaking, people from the synagogue official's house arrived and said, "Your daughter has died; why trouble the teacher any longer?" Disregarding the message that was reported, Jesus said to the synagogue official, "Do not be afraid; just have faith." He did not allow anyone to accompany him inside except Peter, James, and John, the brother of James. When they arrived at the house of the synagogue official, he caught sight of a commotion, people weeping and wailing loudly. So he went in and said to them, "Why this commotion and weeping? The child is not dead but asleep." And they ridiculed him. Then he put them all out. He took along the child's father and mother and those who were with him and entered the room where the child was. He took the child by the hand and said to her, "Talitha koum," which means, "Little girl, I say to you, arise!" The girl, a child of twelve, arose immediately and walked around. At that they were utterly astounded. He gave strict orders that no one should know this and said that she should be given something to eat. In our Epistle reading (2 Corinthians 8:7,9, 13-15), St. Paul exhorts his beloved community to excel in generosity. He uses Jesus' example of trading his richness for the poverty of death, so that we would be rich in relationship with God. As such, we should share our abundance with others. Did you notice that Jesus is an equal opportunity healer? Both the wealthy, powerful synagogue official (Jairus) and the penniless social outcast (the hemorrhagic woman) were powerless to change the outcome of their situation. Jesus did not look upon their social status or wealth, but simply their faith. Faith is the key that unlocks Jesus' mercy. We are called to "not be afraid but have faith." We are invited to fall at the feet of Jesus with our problems, fears, and our sickness with utter and complete faith. What is it in our lives that we need to place at the feet of Jesus?